The excitement of Paris is over and it is now time to enjoy our beautiful village with my daughter and granddaughter. 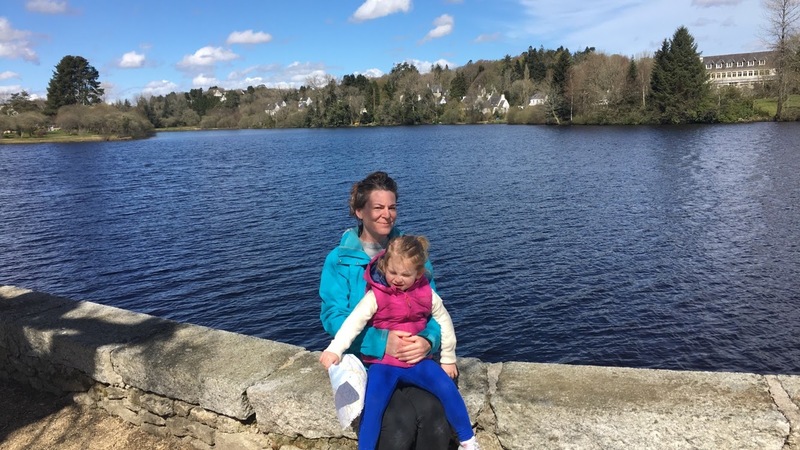 As most people who have any contact with 3 year olds will know, Dora the Explorer is a hero, and what better way to spend a sunny afternoon than going on a treasure hunt around a lake and a forest? I have made a map, from our driving atlas, I don’t think we are visiting Slovakia any time soon, so we will not miss this page. We set off from the house, and walk to the lake, then it is over the bridge and past the big dog, I think he really enjoyed being part of it, as this dog guards a work shop and doesn’t have much interaction. Back to the lake and we pass the swans and find the park where I have managed to hide the treasure. It is a great afternoon, and the sun is shining, you really do not need to spend a fortune here to entertain kids, unfortunately I forgot that little legs get tired, we didn’t make it in to the forest today, but we can always go tomorrow, it is just so hard to believe our holiday is rapidly coming to an end. On the way home we pass the old lavoir, there are 2 of these in Huelgoat, the other is near the centre of town, we had thought that these were just preserved as tourist attractions until we actually saw someone bent down scrubbing work clothes! If you enjoy walking or have small children Huelgoat really is one of the best places for a holiday or even a day trip if you are in the area.